We just ran a week of the Worm Moon Alpha, and have been incredibly happy with the amount of great feedback we've gotten from our alpha testers (including a bunch of you that backed at the Chieftain tier or higher!). If you did get in the alpha, remember to share your feedback and thoughts over at community.abbeygames.com. We've gone over all this feedback and the next couple weeks of development are all about making the game bigger and better, taking the alpha feedback to heart and taking some big steps towards the Early Access release. Let's take a look at some of the stuff we've built in the past week or so! The Worm Moon alpha had only 3 of the 10 disciple classes implemented. Adriaan has been designing abilities for several other classes and Carmen has been animating and drawing to make these classes come to life. Next in line to appear are the Songsmith, Smitesword and Beastwalker. Expect the Songsmith, and their good friend, conch shell, to make an appearance next full moon! If you've seen any of the streams, you'll have noticed the map's borders were a terrifying existential black void. Well, Marlies and Daniël have been hard at work to replace that horrifying emptiness with a beautiful cliff edge! Are you brave enough to place your temple by the cliffside?? Keep away from the edge! ... But it's so pretty! Daniël has also been hard at work at creating weather effects for the game, such has thunderstorms and heatwaves. These will play a big part in your religions 'lightness' or 'darkness': will your holy site be forever bathed in sunshine or will it be a murky, dark, cult? Last stream we checked out some basic passive abilities that your Disciples learn as they level up. 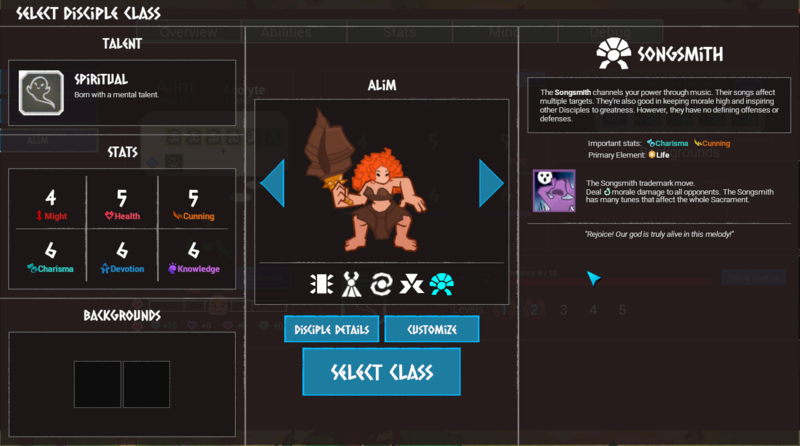 Game designer Adriaan has created a new one: a 'trigger' passive ability. This passive ability allows the character to perform an 'action' ability (for example, an attack) once it is triggered. An easy example of this would be the Counter Attack passive ability: When the Disciple is struck by a physical hit, they immediately counterattack the attacker. The interesting thing is, you can slot any ability into the passive; so it's up to you which attack is used to counter attack in the above example. The passive ability does put certain limitations on this, you couldn't put a healing spell in the Counter Attack slot. These could be much wilder too, like a passive that triggers whenever an ally uses a Nature element attack. There's a bunch of cool trigger passive abilities we're considering that would allow you to set up some powerful combos or exploit an enemies' weaknesses! Any guesses? Your little worshippers will perform different jobs around the holy site! This is heavily in development, but let's look at some concept art by character artist Carmen! Huh? I think we're missing the 'sun-fearing gamedeveloper' job? An overhaul of the holy site's buildings, many new locations to build, improved commandment content, redesigned User Interfaces, and some exciting new features to express your god are all in active development! Wow! That's it for now, young gods! Check back next week as we wade ever deeper into the murky pits of Godhood game development... that metaphor really got away from me there. Let me distract you with a fun bug! "While the disciple's corn business flourished, Tetecal craved fish." See you next week young gods! Remember to spread the good corn!